Steve Smith produces functional, decorative and sculptural works in clay, steel and stone. A graduate of Bluffton College with Masters Degrees from Bowling Green State University, he taught at Defiance College from 1980 – 2011. He has exhibited in major regional and national exhibitions since 1974. Steve’s works are held in many private and corporate collections across the country. 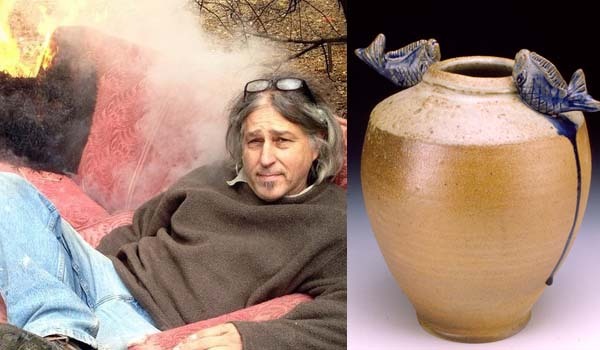 Steve’s work has also been featured in many national publications and he was the subject in the 2001 film Steve Smith: Clay Dancing in Flames. Internationational interests include leading two study tours to Italy and one to the Netherlands. Recently he was sent to Chile to do technical training for potters at El Bodegon Cultural de Los Vilos. He has traveled to the International Center of Bethlehem, West Bank, Palestine to conduct a workshop on ceramic techniques and consult on developing programs at their new art school, the first in occupied territories. Steve’s current international projects are at the Indian Church Village Artisans Center in Belize helping to revitalize ceramic traditions and production in the Mayan Community at the Indian Church Village Artisans Center in Belize, and teaching wheel throwing techniques to the potters in El Ojoche Nicaragua as part of a partnership with Potters for Peace.